There are few things in life quite as satisfying as a 7″ single pressed on really heavy vinyl. This EP is an example of this; a substantial and shiny frisbee of a platter that thunks pleasingly down onto a turntable and feels like it must sound better than a poorly-pressed, bendy, thin, cheap record… right? There’s no release date mentioned on this record anywhere; as far as I remember it was released in around 2004 or so (and Discogs seems to agree). Help She Can’t Swim were a breed of band that was prevalent in those early ’00s; independent, fun-loving, very colourful, noisy, accidentally fashionable, and joyously free of the weight of sarcasm, irony or self-aware po-faced-ness. Musically they were something of a mashed-up combination of Bis, Heavenly, Lightning Bolt, Nirvana and The Raincoats. At the time, the All Tomorrow’s Parties festival was at its height of yet-to-become-super-popular popularity, and Help She Can’t Swim were the type of band that would decamp en masse to Camber Sands to get drunk and listen to noisy bands. They were probably one of the many bands that staged surprise ‘chalet gigs’ – they didn’t need to be on the official line-up, they just played a gig wherever they felt like it, Summer Holiday-style. This record was released by Vacuous Pop, an Oxford-based label who at the time were at the epicentre of Oxford’s own take on that ‘ATP music’-related scene. Run by an amazingly energetic and positive guy called Ady, Vacuous Pop released records by bands including Cat On Form (a member of whom went on to form Blood Red Shoes), The Edmund Fitzgerald (members of whom went on to form Foals) and Youthmovie Soundtrack Strategies (members of whom went on to form, erm, Youthmovies). Ady also promoted some of Oxford’s best ever gigs, as well, and these created some of my fondest memories of gig-going – for a while, Oxford seemed like the centre of the nation’s musical scene, and some tiny venues played host to some incredible bands. Ady was kind enough to commission me to produce posters for most of his gigs, and every one of them was a joy to put together. 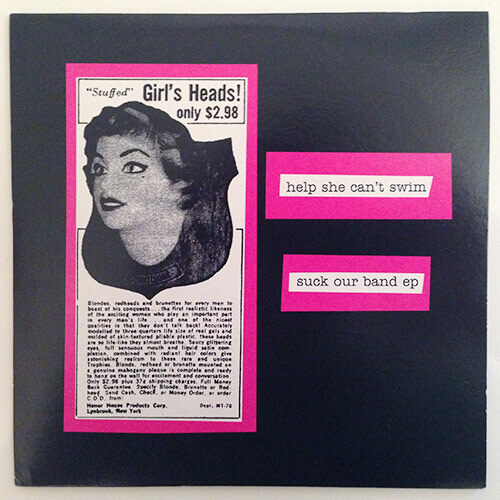 I was involved in the creation of the artwork for this Help She Can’t Swim record: not so much in the art direction, as the band provided the elements and very strong guidance as to how they wanted it to look. They supplied their images on a disc! This was sent in the post! Crazy, pre-broadband days. I was more of an artworker on this task, making their vision come to be, and handling the mundanities of getting artwork print-ready for duplication. This, and the other Vacuous Pop releases I assisted with artwork on, are proud nuggets of design work for me. This record should be numbered (“Record number [blank space] of 500”, it says on the rear sleeve), but my copy is not numbered. Does that make it rarer than one of the numbered copies? Is it one of the 500? If so, what number should it have? Who knows. I don’t mind.